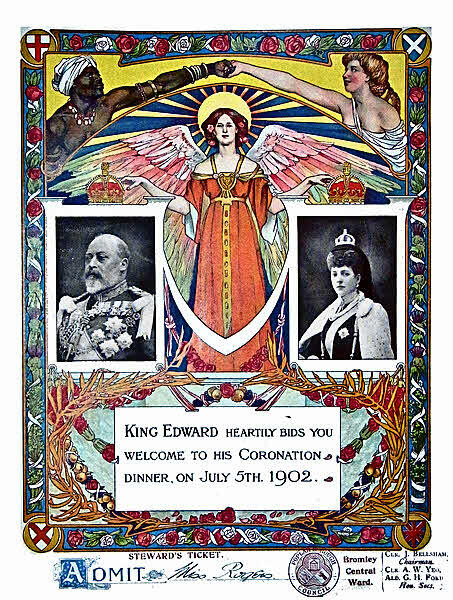 Invitation to King Edward VII’s coronation dinner to be held 5th July 1902. This very large invitation card (12” x 9.5”), presumably intended for framing, is a stewards ticket issued, on behalf of Poplar Borough Council to Miss Rogers of Bromley Central Ward. The 5th of July was a week after the intended date of the coronation (June 26th). Unfortunately The King went down with appendicitis just two days before that date and Sir Frederick Treves of The London Hospital (he of Elephant man fame), assisted by Lord Lister, performed an emergency operation. The coronation was finally held on the 9th of August.